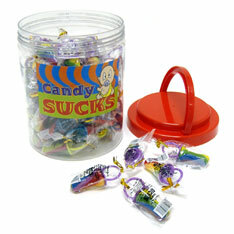 Colorful Rings fashioned with delicious hard candy. Meaures 1 inch by 2 ¾” . Individually wrapped. Sold in 60 count tubs. $28.25 per pack (60 pieces). $18.45 per pack for 8 packs or more. $15.85 per pack for 16 packs or more.